In early 1947, when Jean Cocteau started to live at Milly-la-Foret, in the house where he was to die nearly 20 years later, he met a young gardener, the sensationally handsome Edouard Dermit, who was destined to play a leading part in his life and work. Dermit was 22 when he first encountered Cocteau. He was the son of a Lorraine miner, and Edouard too worked in the iron mines, developing the magnificent physique that Cocteau was to reveal to the world in three of his greatest films, Les Enfants Terribles (1949), Orphee (1950) and Le Testament d'Orphee (1959). His name in this last of Cocteau's films was Segeste, but he had been baptised Antoine, and Edouard was a name given him by his mother, popularly shortened to Doudou. Segeste was the name of one of Cocteau's angels in his early poem "L'Ange Heurtebise." 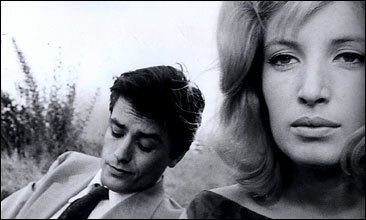 The poet entrusted the direction of Les Enfants Terribles to Jean-Pierre Melville, and Dermit gives a fine restrained performance as Paul, playing opposite Nicole Stephane as his sister Elizabeth. This memorable performance by an unknown actor, carefully coached by Cocteau and sensitively directed by Melville, was a sensation. The beautiful lighting and the haunting music by Georges Auric added to the film's spell. Dermit's beauty was again displayed to artistic effect by Cocteau in Orphee, which also had music by Auric. As in Les Enfants Terribles, Dermit was surrounded by well-known artists - Jean Marais, Maria Casares and Francois Perier, with Juliette Greco in a small part. But such was his natural dignity, physical charm and magnetic personality, he shone with a special magic among all those seasoned professionals. Edouard Dermit excelled himself in Cocteau's last film, Le Testament d'Orphee. He plays a young poet, Segeste, who leads the poet Cocteau away from the questions asked by the tribunal at the end of Orphee. Segeste had died in the earlier film, and he returns here as the older poet's guardian. Most of the film was shot in Les Baux-de-Provence, which is perched high on a hill. The entrance to Les Baux is called le val d'enfer (the Valley of Hell) because Dante once lived there and there is a local belief that it inspired several scenes in the Inferno. Much of the film is set in the nearby white chalk grottoes of Les Baux. Cocteau had hoped to make a film there of Racine's Britannicus, starring Jean Marais, but it never came to fruition. Cocteau had soon discovered Dermit's gifts as a painter, and taught him all he knew about the techniques of art. When he died in 1963, Cocteau left many drawings and sketches, and these his adopted son was able to use in order to complete his master's work there. Edouard Dermit married and had two sons, Jean and Stephane. Jacqueline Picasso and Jean Marais were the godmother and godfather of the former, while Francine Weissweiler and Pierre Berge fulfilled these duties for the second. Along with Jean Marais, Dermit took care of Cocteau's artistic heritage, and continued to develop his own gifts as an artist.